This is one of those books that has a lot of information, some obvious, some informative. 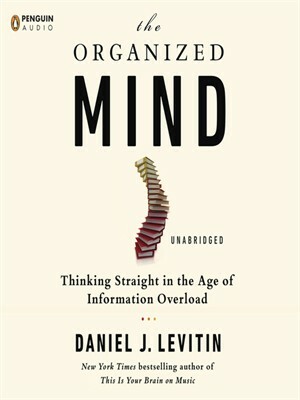 Levitin gives practical advice on getting organized in this age of too much information. The author spends time to explain, with examples, how to implement his ideas. The discussion of how our brain works in dealing with information is easy to grasp and as my Calculus teacher used to say, “obvious to even the casual observer”. While parts drag a little, overall the book reads quickly. There were two points that I was glad to see aired. First, there needs to be a change in how and what we teach children. Levitin makes the point that we need to be teaching how to handle information as opposed to teaching information. Second, he ends with everybody needs a junk drawer. There are some things that just don’t fit into a category or are to few in number to separate, so just let them collect off to the side. This has applications at least for me, you will have to read and decide for yourself. The author gives a practical mathematical method for making decisions using a four square box. There is even an appendix that helps the reader to grasp this concept. If one applies this along with the Ben Franklin method of a list with pluses and minuses, no decision should be too difficult. The only flaw is, at times, the author injects more of his personal bias than one would expect in this type of book. This shows mostly in the sections on medical issues. Still. this is a good read and if it makes you think then Levitin has done his job.